Create and customize automated follow-up schedules for your sales team. Manage and create new appointments and tasks for your sales team. Text customers from Selly Automotive and manage opt-ins to be compliant. Setup automated replies to internet leads and manage sales team lead response time. Fast onboarding and training fits in smoothly with existing sales processes. Mobile is a “must have” for a CRM with statistics showing an increase in the amount of fresh-ups added by 30% when using a mobile CRM tool. Selly™ for the Dealership Mobile literally puts social media marketing tools in the hands of car sales professionals to connect with their customers online from anywhere! Research suggests that 79% of sales resources that use social media selling tools outperform those who don’t. Frees up your sales team to SELL! The dashboard also allows for custom tracking as well of offline and online marketing sources. For example, if your dealership is running a mailer campaign with a specific call to action that can be tracked by adding it in as a marketing source under the Selly Dealer settings menu. Online marketing sources like Facebook campaign can be manually tracked as well. We have an easy to use dashboard where you can enter the monthly subscription cost of your internet lead providers like TrueCar and our dashboard will automatically calculate based on sold deals: the conversion rate, cost per lead, and most importantly, cost per sale. That gives you as the dealership the must-have business analytics about lead spend. 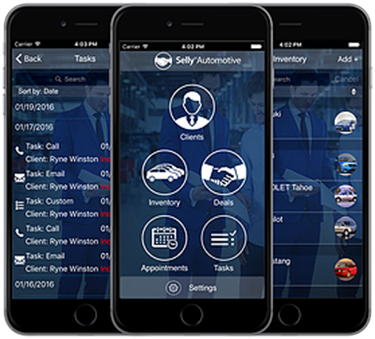 Selly Voice allows your dealership to track and record phone calls made through the Selly web or mobile platform. Selly Voice allows management to hold their sales team accountable and train via our stored call archives from follow-up calls, inbound sales requests, and other dealership activity. Best of all, when a customer calls your Selly phone number the client will be routed to their salesperson's direct line. We keep you compliant by sending Opt-In SMS text messages to customers and allow them to Opt-out if they wish to receive no further contact. Additionally, if you ever let go of a salesperson, all of the SMS texts will be stored in the Selly platform and management can have transparency into what is texted to customers. We support both SMS (Text Only) as well as MMS (Photo/Video URL) messages. Start generating texting leads directly from your website with the new texting tool from Selly. 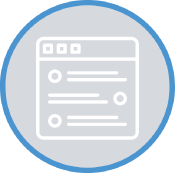 Our tool will work with any dealership website and all you need to do is have your site provider add the simple code snippet. Customers can text you right from your website and it complements your Selly voice and text capabilities.